Experience the luxury of Belgian linen at an affordable Blick price! 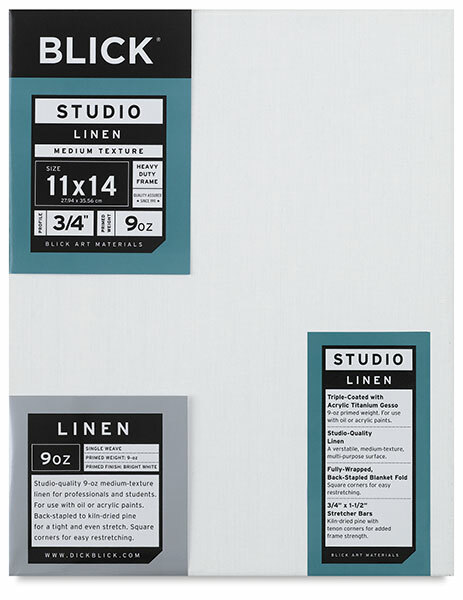 Economically priced for students and professionals, Blick Studio Belgian Linen Canvas is the perfect high-quality substrate for ensuring archival longevity, or for those who prefer linen's unique texture. Pure 6 oz Belgian linen is primed with three coats of acid-free acrylic titanium gesso to reach a finished weight of 9 oz. It's then hand-stretched and back-stapled around solid wood stretcher bars. For quality, dependability, and affordability, there simply is no better choice!